I just wanted a company I could trust to take care of my home and furnace so I didn’t need to worry. You guys protect my price and service my furnace, adjusting it to use less oil. I never run out and all your people are a professional pleasure. Thank you! Indeed, I don’t worry about my warmth! We would like to “shout out” another thank you to your very fine technician Kyle. He responded promptly, both by telephone and in person, to our call for emergency service last evening when we suddenly discovered that we did not have heat or hot water. Kyle was personable and courteous. He listened to the description of our problem, applied his knowledge about electrical and heating systems, familiarized himself with the particulars of our furnace and thanks to his skills, we were able to enjoy heat and hot water once again! Thank you for your very kind efforts and understanding. Your service is greatly appreciated. Thank you for the great service. We appreciate it very much. Thank you. Thank you for your very prompt service on Tuesday. Heating oil was delivered by 9am and the technician was here very shortly afterwards to check out the furnace-Thank goodness since the condenser needed to be replaced. As always, NO OTHER COMPANY gives me such prompt, professional and customer-centered service. Thank you to all involved. 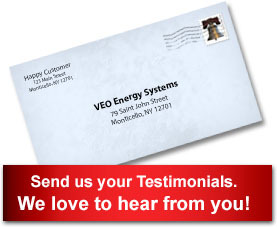 The first time VEO serviced my furnace I was shocked. They didn’t just vacuum it, they actually replaced dirty nozzles and calibrated if for efficiency so I used as little oil as possible. I made a joke to the tech about how using less oil can’t be good for them and he said “good service is good for us”! They have done the same annually for five years now. Your motto "Warmth Without Worry" reflects the concern you have for your customers. This is especially true of Patrick McGar, a technician in your employ. About a year ago, Patrick appeared at my home, late at night to resolve a frozen pipes situation. He worked laboriously to alleviate the situation. He did so without complaint and with the utmost of courtesy and professionalism. People like Patrick with these attributes are rare and special. He exudes a value system that is impeccable. He should be commended for his loyalty to VEO. About 2 weeks ago, I discovered a slight puddle of oil underneath the tank. I notified your company and a short time later, your Service Dept. Supervisor Patrick responded to my location. I explained the problem, and offered the theory that the leak might be from the oil feed line to the boiler. Upon getting under the boiler, Patrick gave me the bad news--the leak was from the tank itself! From the moment the diagnosis was made, the actions of Patrick and the rest of your service team was immediate and commendable. That same afternoon Patrick and Roger carefully maneuvered the tank out of the closet, without having to remove a wall, as I feared they might have to. They then installed the new tank with ease, again without any collateral damage. Roger hooked up a temporary line, and returned to ensure I would not be left without oil until the permanent hookup was made. Roger and Jason returned and completed the job. During each step, I greatly benefited from all of their great knowledge, so that not the smallest detail was forgotten.In addition, it was all done with the greatest degree of true workmanship and cleanliness, AND courtesy! Having been a longtime customer of your company, all this is not unusual to expect from your staff, but it is VERY unusual to expect at all in today's environment of greed, discourtesy, and general apathy. This message is to express my appreciation, and kudos to your staff and to YOU for encouraging such professionalism. These guys are KEEPERS. Thank you! Thank you for the wonderful service. I had to call on a holiday evening and your answering service was very helpful and your technician, Chris was very obliging. I surely did appreciate your prompt response. It would have been a cold night! I want you to know how much I appreciated the wonderful job you and your men did for me when you installed the new heating system. It was a job very well done in every way! It has been a pleasurable and informative experience speaking with you regarding the two furnaces and the fuel oil requirements for the church. Not only did you answer all of our questions, you went into detail regarding all aspects of setting up our account, billing and explained how the "cap price" works. We cannot begin to thank you enough for the superb service and kind heartedness your team expressed to us. We are very grateful and look forward to a long mutually rewarding relationship with the Van Etten Oil Company. On behalf of all of St. John's Church, thanks for everything.